The LSAT is a “speeded” test, which means that the majority of test takers are not able to complete it. On three of the four scored sections, your time is mostly spent on choosing your answers, but in the Reading Comprehension section, a significant chunk of time is spent just reading the passage. Then you spend a lot more time re-reading the passage to try to decide on the answer. 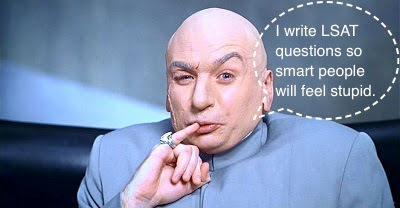 The worst mistake a slow reader can make is to skim through the passage and the questions and circle answers that “sound right.” My students who have tried this approach on PrepTests consistently get worse results than if they just had flipped a coin. There’s a reason for this–the folks who write LSAT tests spend a great deal of time and energy trying to come up with wrong answers that sound right. Remember: their job description is to write tests that make smart people feel stupid. If your LSAT goal is something under 165, reading speed is important but not critical. You can flip through the four passages, decide which one you like least, and skip it. (Don’t forget to bubble in a string of answers, however. On average, you’ll get one in five right.) That gives you eleven minutes and forty seconds per remaining passage. If you really comprehend what you have time to read, and get familiar with reading comprehension questions, you could skip an entire passage and still get 20 out of 25 questions right. If you got every other question on the LSAT right, you’d be at the 99th percentile. If your goal is 165, you’re in good shape. Most of us can’t count on getting every other question right and lucking out on a couple of random answers on the passage we skipped. So if you are a relatively slow reader who wants to go to a top five law school, you’re going to need to do something more. One solution would be to change your goals. Top five law schools are full of top five students with top five reading speeds. Getting accepted to the law school of your dreams might turn out to be a nightmare if you find you can never keep up with the load. Another solution would be to change your reading speed. You don’t need to be a speed reader to do well on the LSAT, but you can’t afford some of the bad habits that make some readers extra slow. The challenge of the LSAT may be just the motivation you need to overcome some problems that have plagued you since grade school. Measure your reading speed (speed test courtesy of Staples.com). Measure your reading speed again after a week or two of regular practice. If your speed is increasing, keep practicing! If you don’t see any improvement, do more research on your own or contact a reading tutor. World’s Best LSAT Tutors: How Do I Choose? Search for “best LSAT tutor” and you’ll get page after page of hits. There are the “promoted” sites at the top, followed by one LSAT company after another. If you’ve been looking for an LSAT tutor for a while, the names are all familiar. If you’ve just started, they’re all a blur. How can a person who doesn’t even know what they’re looking for find what they need? Try to find a tutor who scored at the 99th percentile. Your tutor should be better at this than you are! Get someone with a good reputation. Check reviews, ratings, word of mouth. Experience is helpful, but it isn’t everything. A lot of younger tutors just took the LSAT themselves. If you’re going to spend money on a tutor, spend enough to get a good one. Try before you buy. If the tutoring company doesn’t offer some kind of “good fit guarantee” (where you only pay for your first session if the tutor is right for you), then only sign up for an hour or two for starters. The Lawschooli article assumes people are looking for in-person tutoring in a local area. The LSAT, however, is a perfect fit for online tutoring. Everything a tutor and a student really need to do together can easily be accomplished on an interactive whiteboard. WyzAnt (the tutoring service I use) currently has more than 300 self-employed online LSAT tutors. Unlike some of the big LSAT companies, which select their reviews, WyzAnt posts every rating and every review, whether it is flattering or embarassing. You can sort prospective tutors by price, rating, or “best match.” You may have to scroll down a bit to find me (I’m still fairly new to WyzAnt, and if you’re sorting from highest price to lowest, I’m way down the list), but you’ll find other people in this series right up at the top. Author ScottPosted on February 12, 2016 February 12, 2016 Categories Tutoring, WyzAntTags WyzAntLeave a comment on World’s Best LSAT Tutors: How Do I Choose?